In this sudden urge for post-apocalyptic movies, comes yet another entry that will blow your mind away, literally. Acclaimed director/screenwriter/producer Guillermo del Toro has put his hands to work once again, this time as director and co-writer of what was sold as the biggest summer blockbuster movie that would come out: Pacific Rim. And what better way to sell such a movie than by having such a visionary director as del Toro taking part in it. This is the guy that wrote and directed the Hellboy series and the classic that is Pan’s Labyrinth. And let’s not forget, he is one of the writers in The Hobbit trilogy. So, given these facts, what can be expected from Del Toro’s Pacific Rim? As much as you can get from a movie about robots fighting aliens. In other words, you will get the most beautifully envisioned movie of the year since Oblivion, but almost no story to help it go any further than just style. What Guillermo del Toro has done here is create Oscar-worthy scenery and cinematography, but has left aside all the elements that make up for a good plot, which is probably what Guillermo del Toro is best known for, his storytelling and originality. 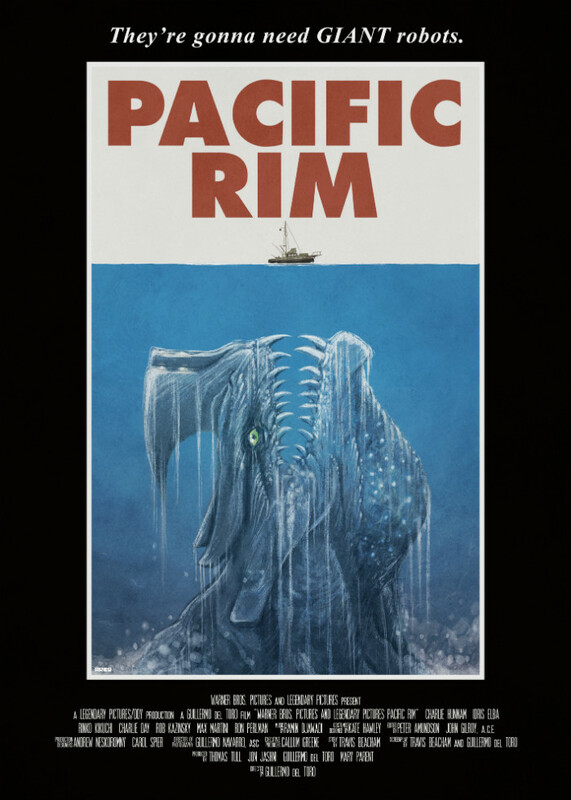 Pacific Rim starts off in present day 2013, when the world is attacked by colossal beasts named Kaijus, who came to Earth through a portal in the bottom of the Pacific Ocean. In order to battle them, humans build the Jaegers, just as colossal machines piloted by two people at the same time whose brains are linked through the Jaeger’s system, in order to be able to control the complicated machine that is the Jaeger. However, the leaders of the nations of the Pacific Rim decide to discontinue the project in 2025, given the fact that the amount of Kaiju attacks was becoming more frequent and impossible to stop. Instead, they decide to build massive and powerful walls around the coasts in order to stop the Kaijus from entering. After hearing this, Commander Stacker Pentecost (Idris Elba) decides to call back Raleigh Becket (Charlie Hunnam), the best pilot he had ever had, to join forces with the other three remaining Jaegers and stop the Apocalypse from reigning over the Earth. This will bring him to fight alongside a new rookie partner, Mako Mori (Rinko Kikuchi), and will find him battling the biggest and strongest Kaijus that had ever set foot on Earth. Pacific Rim is the most beautiful looking movie of this year, and it would not be a surprise if it is nominated for an Oscar based on its wonderful cinematography and special effects. The scenery is over-the-top unique. The Jaegers are amazing to look at. You can see and feel the amount of work that was put on each of its parts, be it the head, the arms, its surface, its inside, or anything else. And even with all these details to admire, all of this is nothing compared to the beauty that one beholds when they are in movement and fighting. One can easily recall the Autobots and the Decepticons fighting each other in the Tranformers movies when we see the battles in Pacific Rim, but they do not compare at all with the fights between Jaegers and Kaijus. The Kaijus are also beautiful to gaze upon. At first look, one might think they are just some more of the same insect looking aliens that appear in every other movie regarding some extraterrestrial form. However, what I saw in the Kaijus was something different. They are some sort of a mash-up between the aliens from the Alien saga and Godzilla. All of them had some characteristics that were equally shared, like their height and the “normal” alien look one sees in other movies. However, each of them has at least one characteristic that differs them from one another. For example, the one that I thought was the most well crafted was a pretty simple one. It was a fat Kaiju. I’m serious, one of the Kaijus was fat. If I recall, there were two or maybe three Kaijus involved in this fight, and the one that I thought was the best one was the fat one. Of course, I laughed at the moment, but after that battle ended, I came to think about it, and it was absolutely genius the fact that they made a fat Kaiju. It reminded me that there was more than one Kaiju, not like in other movies that all beasts and creatures look the same, and you do not know if it was the same creature that the main character was fighting or if it was another one. It is marvelous the fact that each Kaiju was physically different. In visionary terms, Guillermo del Toro made a masterpiece of a movie with Pacific Rim. 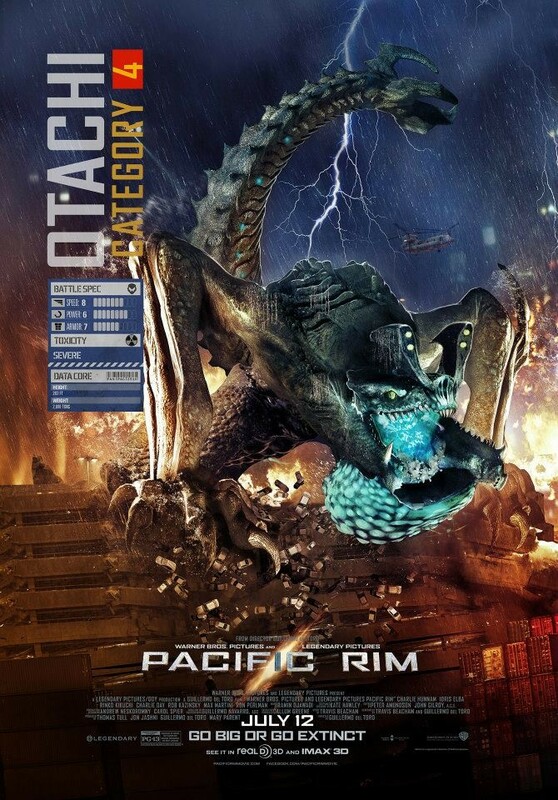 Sadly, this is about as much as we get from Pacific Rim, just some “Wow, that looks awesome!” moments. There is not much else in this movie that Guillermo del Toro should be proud of. Like for instance, the sound editing that goes with the battles is just disturbing. All you can hear is metal pieces clashing, many things blowing up, and Kaijus screeching, among other things. Sound editing can be so much more important than visuals at times like this, and it just sounds preposterous. Just imagine going to your kitchen with four little boys hitting all the pans at the same time and one little girl yelling her lungs out. If you find that to be pleasant to your ears, then all I can say is that you have earned my respect, and I myself will pay your ticket for Pacific Rim. However, the biggest problem of this movie is the fact that it sports a significant amount of style over a diminutive amount of substance. There is no messy plot because there really is no plot. The only story behind the movie is that there are Kaijus, and humans are trying to defeat them with Jaegers, nothing else to it. 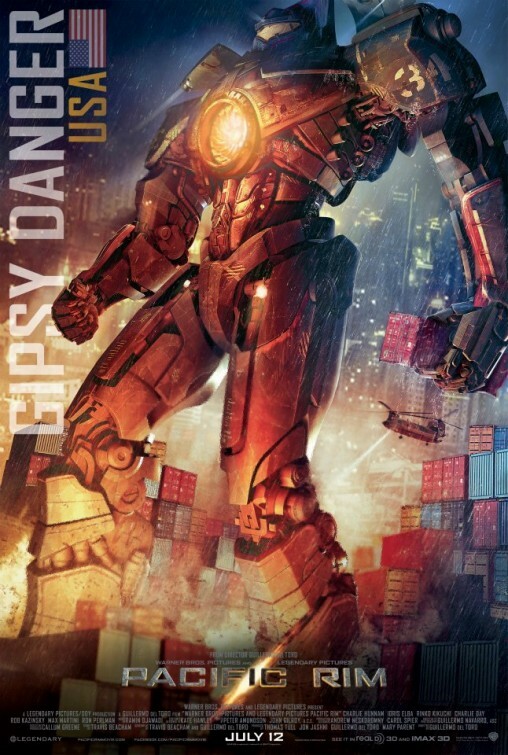 Pacific Rim relies completely on the fact that it has stunning visuals to move this film forward. This movie goes for around 130 minutes, in which maybe 30 minutes are given to actually dig into the story. And the other 100 minutes? Strictly action scenes and other unnecessary scenes with witty dialogue . And guess what? After a point, the movie isn’t even that entertaining; it just becomes plain stupid and ridiculous. It feels like the film crew first put down all the battles they wanted to see, and then decided to put some dumb story elements in between each battle not even to actually give us a plot, but to build up the momentum for the battles approaching. The characters, for example, are as shallow as they could be. “But why would we waste time developing characters? There are going to be many, many battles between robots and aliens! That is more than enough!” Wrong. Without real characters, there is no movie. And in Pacific Rim, it feels like the main characters are not even the humans, but the Jaegers. As for acting, it is mostly okay. Charlie Hunnam as Raleigh Beckett is just your average puffed-up guy from any action movie. Rinko Kikuchi as Mako Mori is mostly tolerable, but a lot less whining would have come in very handy. Idris Elba is pretty good as Commander Stacker Pentecost, showing signs of strength as the leader of the Jaeger program. The two actors that do shine in this movie are Ron Perlman as Hannibal Chau, a Kaiju body parts seller in the black market, and Charlie Day as Kaiju-obsessed scientist Dr. Newton Geiszler. Their scenes together are probably the most entertaining parts of this movie. Thought their interaction in the movie is pretty short, there is such chemistry between these two that it is impossible not to notice. I could have easily watched a whole movie based solely on both of them. There is no doubt that Pacific Rim falls below the category of a summer blockbuster movie, just in the lower part of such listing. Yes, it does have the action, the laughs here and there, and the breathtaking scenery, but it also has little to no plot, extremely shallow characters, and it is about 20-25 minutes longer than it should have been. Summer blockbusters are supposed to keep you entertained throughout the whole movie, like World War Z this summer, or for a more similar comparison, Transformers (the first one, not the crap that were the second and third one). In the end, Pacific Rim ends up being one of Guillermo del Toro’s lesser films. And with news already that a script for a sequel is being written, let’s hope that the real Guillermo del Toro steps up and gives it those elements of genius storytelling that he is known for.